Wat Pha Suttawas is the second most visited temple in Sakon Nakhon after Wat Phra That Choeng Chum. The temple is famous because of its association with Ajahn Mun Bhuridatta Thera, a Buddhist monk who died at the temple in 1949. 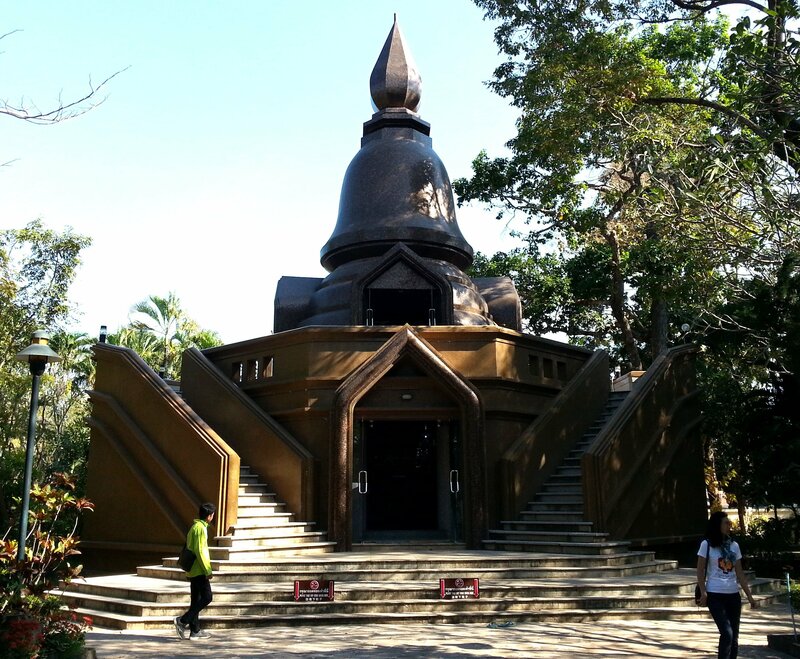 Wat Pha Suttawas is open daily from 06:00 to 18:00 and admission is free. 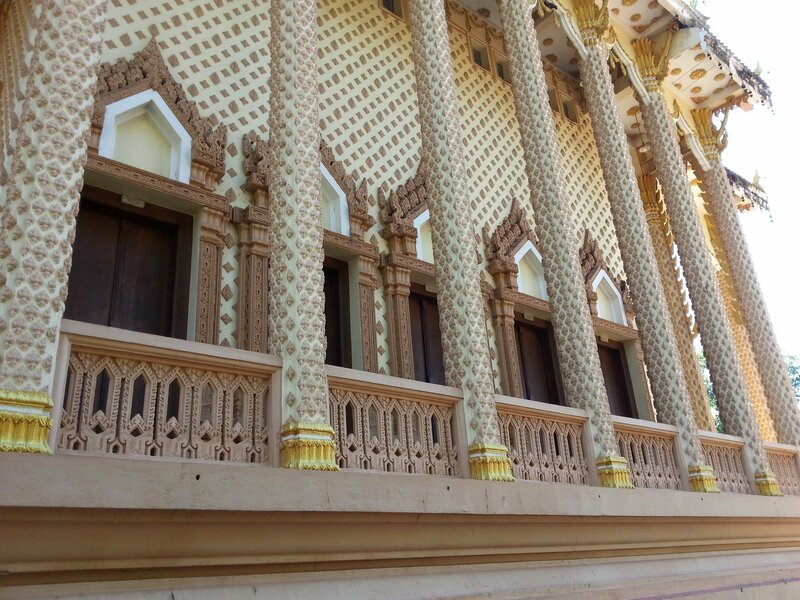 The viharn, or congregational hall, at Wat Pha Suttawas is particularly tall and ornately decorated. 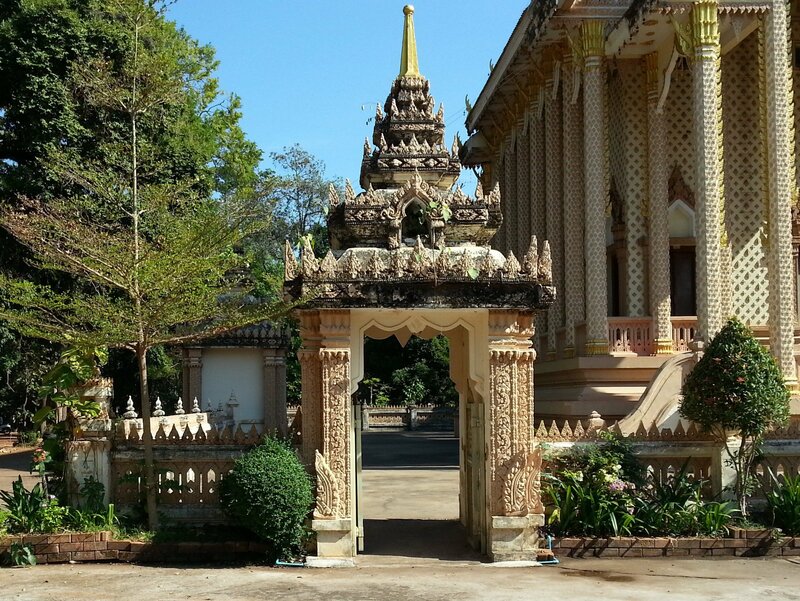 Around the four sides of the viharn at Wat Pha Suttawas is a low wall each with a magnificent Khmer style entrance way. During the 10th and 11th centuries the Khmer people built a number of temples in Sakon Nakhon Province and the modern day Buddhist temples in the area are often built in the locations where these much older Khmer temples once stood. 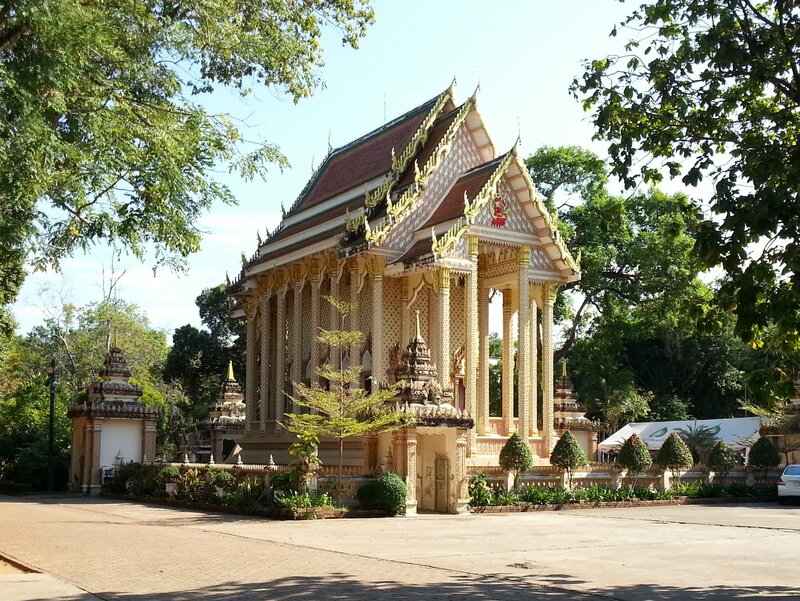 The use of Khmer style architecture at Wat Pha Suttawas is a celebration of this much older Buddhist tradition in the city. The viharn at Wat Pha Suttawas is unusual in that it is decorated in a recurring pattern of diamond shaped reliefs in beige. The effect is striking and it gives the building an appearance quite unlike any other temple in Thailand, or the rest of South East Asia for that matter. The beautiful viharn, however, is not what attracts coachloads of Thai visitors to Wat Pha Suttawas, it is because the great Ajhan Mun died here. Ajhan Mun was monk who lived an austere lifestyle in the forests of Thailand and Laos during the late 19th Century and the first half of the 20th Century. He took the Buddhist principles of how a monk should live to its most extreme interpretation stripping back his material possession to the bare minimum and avoiding contact as much as he could with the modern world by living in a forest, thereby freeing up his mind to allow him to concentrate fully on meditation. Some Buddhists believe that Ajhan Mun attained enlightenment along with supernatural powers, such as being able to read people’s minds and communicate with ghosts. At the age of 80, sensing his own death was near, Ajahn Mun had his disciples carry him to Wat Pha Suttawas. The reason he did so was to relieve the people in the small village near to his camp in the forest of having to provide food for the people attending his funerals, particularly he did not want the local villagers to feel compelled to slaughter their livestock for meat. 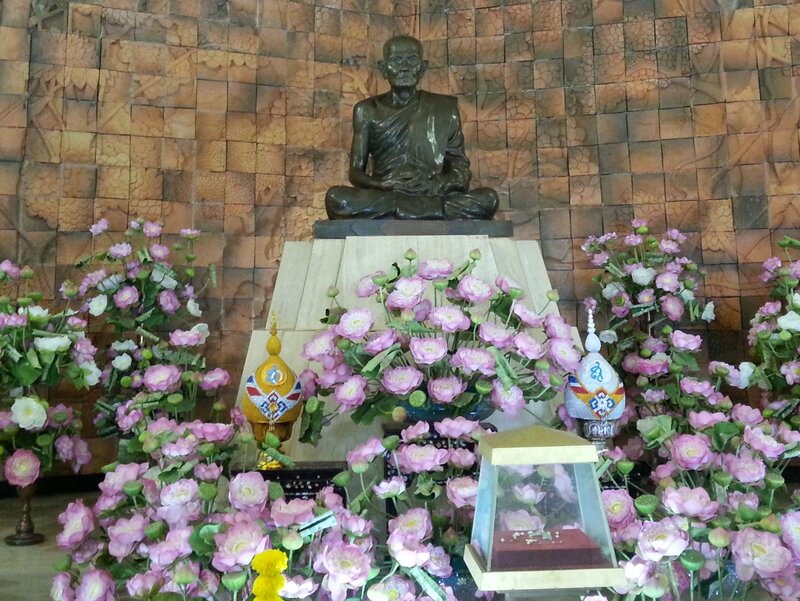 There is a shrine hall dedicated to Ajahn Mun at Wat Pha Suttawas. 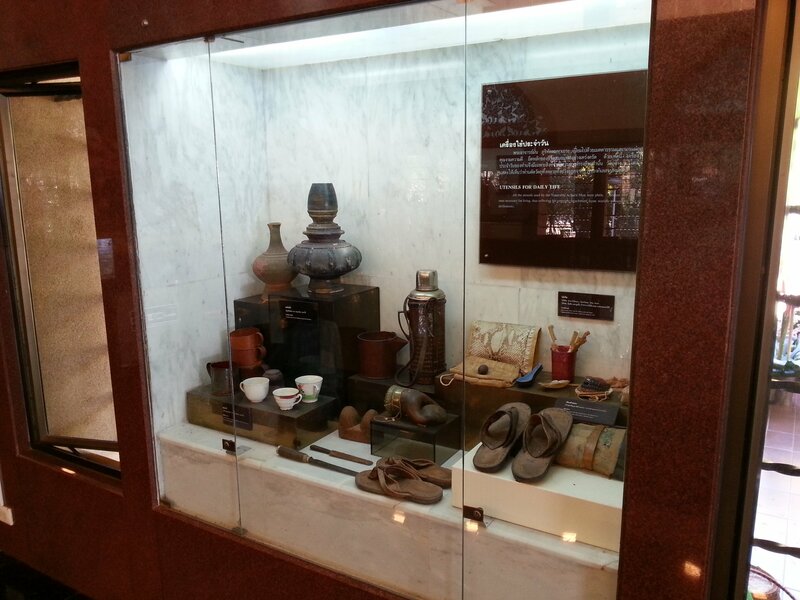 The hall contains a statue of the revered monk along with displays of his few possessions and his books behind glass screens. 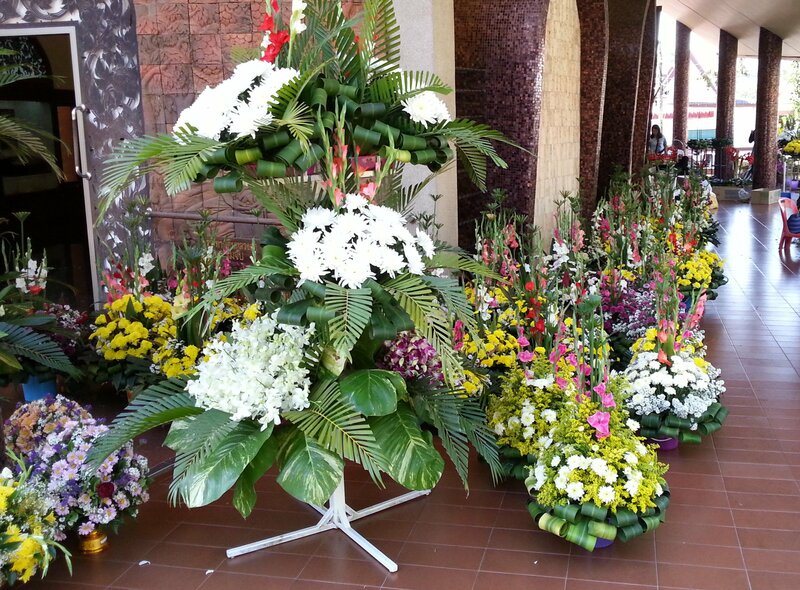 The shrine hall at Wat Pha Suttawas is permanently surrounded by displays of fresh flowers donated and prepared by the faithful as a gift to the spirit of Ajahn Mun. For Thai Buddhists Wat Pha Suttawas is a very significant place and the ‘forest tradition’ of Thai Buddhism that Ajahn Mun adheres to has many followers across Thailand both in the clergy and lay people who consider this branch of the Thai Buddhist church to be a much purer and more genuine form of Theravada Buddhist than is practiced by the wider church. The other point of interest at Wat Pha Suttawas is its modern style chedi, or tower, with a bell shaped base and wide lotus bud shaped top piece. Unlike many other chedi in Thailand, there is no gold on this chedi only smooth granite, which is appropriate for a temple closely associated with a monk who viewed material possessions as an obstacle to spiritual enlightenment. 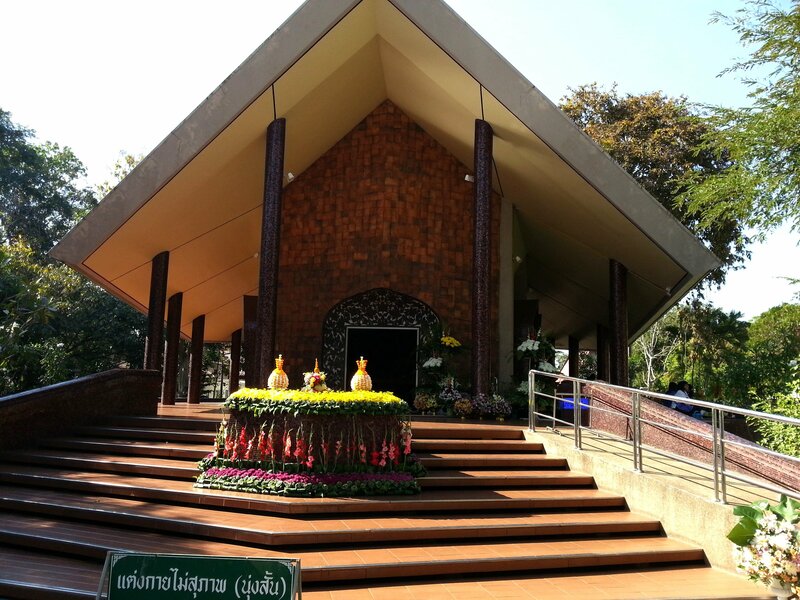 Wat Pha Suttawas is located 5.5 km by road from Sakon Nakhon Bus Terminal 2.